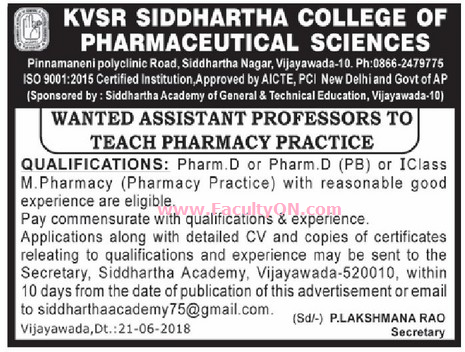 KVSR Siddhartha College of Pharmaceutical Sciences, Vijayawada has advertised in the EENADU newspaper for the recruitment of Teaching Faculty- Assistant Professor jobs vacancies. Interested and eligible job aspirants are requested to apply within 10 days from 22nd June 2018. Check out further more details below. College Profile: KVSR Siddhartha College of Pharmaceutical Sciences was established in 1994 (sponsored by Siddhartha Academy of General & Technical Education) and is affiliated to Acharya Nagarjuna University, and from 2010 affiliated to Krishna University. This is first private (self financed) Pharmacy institution established in Andhra Pradesh. The college offers 4-year undergraduate (B.Pharm) and 2-year postgraduate (M. Pharm) and 6 year Pharm D degree programmes. The college is approved by the All India Council for Technical Education (AICTE) and Pharmacy Council of India (PCI). Qualifications: Pharm.D or Pharm.D (PB) or I Class M.Pharmacy (Pharmacy Practice) with reasonable good experience. How to Apply: The candidates are requested to send application along with their updated resume, copies of certificates and recent PP size photos to the postal address provided below or email address.